New Ignatius Press novel Barely a Crime “is what all first-rate thrillers should be...."
San Francisco, March 29, 2016 – In this new gripping thriller by novelist Robert Ovies, Barely a Crime , two men from the Northern Irish underworld are recruited by an enigmatic stranger for a shadowy operation. Promising to make them very rich without involving them in theft or murder, the job seems too good to be true; in fact, it seems to be barely a crime. When Crawl and Kieran discover the identity of the man who has hired them for the break-in of the century, they realize they might be involving themselves in a high-stakes technological breakthrough, leading them to devise a scheme for demanding a bigger payout. As the law of unintended consequences kicks in, so do life-and-death consequences, not only for themselves, not only for many others, but for the whole world. “Ovies paints a disturbingly compelling snapshot of a criminal underworld. With a strong narrative replete with startling twists and turns, a taut plot and believable characters, Barely a Crime is what all first-rate thrillers should be: terrifying, fast-paced and impossible to put down,” explains Fiorella de Maria, author of Do No Harm. “Barely a Crime is Christ-haunted in the same manner that the novels and stories of Flannery O'Connor are, and it is a gripping and cliff-hanging story, glowing with doom-laden gravitas in the gloom of sin and prideful passion,” says Joseph Pearce, author of Catholic Literary Giants. “From the very beginning this book will grab you by the lapel and drag you into a story of thrilling mystery, madness and thought-provoking grace. It weaves a tale of incremental depravity and redemption with characters who struggle to escape the impetus of their wounded past, and the fears, doubts and latent anger that has come to define them,” says Michael Richards, author of Tobit’s Dog. Robert Ovies, a former advertising executive, is a Catholic deacon. He has a master’s in social work, and with his wife he served as a mission worker on Arizona’s Navajo Reservation. For ten years, they were live-in directors of a communal halfway house in the Detroit area. His first novel was The Rising. Robert Ovies, the author of Barely a Crime, is available for interviews about this book. Read the first chapter of "Barely a Crime: A Novel"
Read the first chapters of the novel Barely a Crime by Robert Ovies. If you like what you’re reading, visit the novel’s page to learn more or order! Kieran Lynch was born in a pine bed in his parents’ lower flat in West Belfast, Ireland, on a night that was, for the middle of summer, unusually cold. His mother, Maureen, cried and laughed out loud when she saw her new son wailing in the Widow Shea’s fat hands, free of his umbilical cord and his purple coloring, his hair already as black as pitch. Kieran’s father, who was called Thomas rather than Tom and who had stayed downstairs in the kitchen with Kieran’s four-year-old sister, Colleen, let out a whoop at the sound of his firstborn son crying and his wife laughing. With little Colleen bouncing in his arms, he danced like the sailor he had been for more than ten of his forty-seven years, wheeling in tight little circles toward the stairs leading to the upstairs bedroom, where he knew that everything was surely better than fine. A sharp knock at the back door interrupted his dance and his momentum; a knock at the back door meant friends or relatives, for sure. Thomas hesitated, undecided about the moment’s highest priority. A second knock sounded as the Widow Shea rushed red-faced and beaming down the stairs and fairly shouted to the proud new father, “Well, for heaven’s sake, you’d better come see your own handsome son, man!” She rushed to gather up Colleen as Thomas’ wife called his name from upstairs and laughed out loud again, bright as a bell. But the knock sounded again, this time more insistent than before, so Thomas exclaimed, “God’s breath. This’d better be good!” and took four quick steps to open the door. How do we decide on how to program computers when we don’t know how to live our own lives? Sci-fi is now reality. The rapid growth of artificial intelligence truly baffles the mind, though not the imagination. Long envisioned in fiction, the creation of “intelligent” computers has arrived and not just for research purposes. Projects are underway to entrust transportation, commerce, and even warfare into the hands of autonomous robots. In the growth of artificial intelligence one key question emerges. How do we judge the morality of robotic choices? This of course only intensifies the debate about human morality itself. In order to program morality one must understand the nature of morality. Materialists envision morality solely in terms of the mechanics of the brain and thus envision replicating this material process in computers. If the essence of morality resides in our spiritual soul (even if working through the material brain) then it would be impossible to replicate a moral sense or conscience. New from Ignatius Press: "Tweeting with God"
Fr. Michel Remery is a Dutch Catholic priest. After studying architecture at the university level, he worked for the Dutch Royal Air Force and then an engineering company in the Baltic States. Later, after finishing his theological studies in Rome, he completed a dissertation at the Pontifical Gregorian University on the relationship between liturgy and architecture. He was a member of an advisory commission for new media and youth at the Vatican Internet Service and worked with young people and university students in Leiden, Netherlands. He is currently vice secretary general of the Council of European Episcopal Conferences (CCEE). – @PatrickMadrid, Host of "Patrick Madrid Show"
Just last month, my media ministry Word on Fire marked a milestone: 10,000,000 views on our YouTube channel. This achievement fills me with gratitude both to God and to the many people who have taken the time to watch one or more of the videos that I’ve produced over the past several years. It also provides the occasion for me to reflect a bit on both the pitfalls and advantages of evangelizing through the new media. When we commenced our outreach through YouTube seven years ago, we did so in the manner of an experiment. YouTube had just come into being at that time, and it largely featured crude, homemade videos of cats jumping off the roof and babies gurgling for their mother’s camcorder. I thought that we should try to invade this space with the Gospel and so I resolved to make short video commentaries on movies, music, current affairs, cultural happenings, etc. We had absolutely no idea whether anyone would watch, and at first, our offerings garnered just a small audience. I distinctly remember being thrilled when one of our videos managed to pass the 500 views mark for the first time. But over the months and years, word spread, and we began to build an audience. The first video of ours to go viral was my response to Bill Maher’s awful movie “Religulous.” In the course of a few weeks, it had been seen by 100,000 people, and it continues to perform well, even to the present. In fact, the atheists have been my most active friends on the Internet. Whenever I do a video on Maher or Christopher Hitchens or Richard Dawkins or Stephen Hawking, I get a strong reaction and lots of views. One of the features of YouTube that I appreciate the most is its interactivity. I have an idea for a science fiction story featuring a race of brilliant creatures that invade Earth. Wait a minute, you’re saying. This story has been told a thousand times, and better than you can tell it! Not so fast, say I. This time, the invaders are militarily inept: no destructive weapons, electromagnetic rays, biological agents. These beings “benignly”, and clandestinely, help us to invent calculating machines; then computers; then PCs; then the host of communication, information, and entertainment devices we have today. You probably suspect that the invaders plan to make these devices so intelligent and so powerful that they take control of mankind, or maybe the aliens intend to introduce brain-controlling waves into these devices to hypnotize the human race. Nope. These creatures merely wait patiently for humans to become dependent on, and addicted to, these devices. When the vast majority of the human race is incapable of thinking and deciding for themselves, the invaders arrive and take control, to the delight of humans who can’t be bothered with anything, except the entertainment and stimulation these devices provide. Maybe my aliens are similar to Isaac Asimov’s Second Foundation, or The Twilight Zone’s Monsters on Maple Street, or the world controllers of Aldous Huxley’s Brave New World, but none of these anticipated the extent to which personal devices have transformed human perception and behavior. Many of us are close to this disassociated, even somnambulistic, state today, and almost all of us—if we are honest with ourselves—fall into this rut occasionally. Patrick S. J. Carmack, J.D. is the President of the Ignatius-Angelicum Liberal Studies Program, and the founder of the Angelicum Academy Homeschool Program and of the Great Books Academy Homeschool Program (2000 AD). In addition to earning his Juris Doctorate, Patrick has completed additional courses in psychology and philosophy, as well as studies at the Institute of Spirituality at the Pontifical University of St. Thomas Aquinas in Rome (the “Angelicum”). He is a former Judge at the Oklahoma State Corporation Commission, member of the U.S. Supreme Court Bar, former CEO of an independent petroleum exploration and production company, founder and former Chairman of the International Caspian Horse Society, and President of a non-profit educational foundation. Patrick was a participant in Dr. Mortimer J. Adler’s last several Socratic discussion groups in Maryland and California in 1999 and 2000, and he moderated the first live-audio Socratic groups online and numerous online groups since. He has spoken on educational topics at various conferences in the U.S. and in Europe. He is the recipient of the International Etienne Society’s Pope John Paul the Great Thomist Humanist Award for his work in education. He recently spoke with Catholic World Report about the Catholic online education, the pros and cons of online technology for learning, and the Ignatius-Angelicum Liberal Studies Program. CWR: Online education has had exponential growth in the last decade; has Catholic online education kept pace? Patrick S. J. Carmack: No, but it is catching up. There is a conservative tendency in Catholic education with respect to the use of modern technology, which results in a reluctance to embrace it. This is probably partly due to a kind of nostalgia for the golden age of Catholic education in the scholasticism of the High Middle Ages and the later, very successful Jesuit pedagogy developed during the Counter-Reformation period. But there is another reason as well, one articulated by Marshall and Eric McLuhan, which recognizes that technology and media themselves change us, and hence society, regardless of the content. There are both advantages and disadvantages to this, but overall the changes are troubling, especially if one connects them to the increasing secularization of the West, where technological change is most rapid. In a word, there is a dehumanizing element to technology that disembodies us to some degree—a discarnation of a sort. That, of course, runs counter to the Catholic love of all reality, including the body and the incarnational aspect of the faith. CWR: It is surprising to hear you criticize educational technology since you work so much with it. Are you opposed to the use of technology in education, to online classes for instance? When Pope Benedict XVI opened a Twitter account in December 2012, it was not a publicity stunt but rather the logical development of Vatican involvement in the communications media that began with the founding of L’Osservatore Romano in the nineteenth and Vatican Radio in the twentieth century. The Second Vatican Council issued a brief Decree on the Means of Social Communication (Inter mirifica) at the conclusion of its second session in 1963, declaring that “it is the Church’s birthright to use and own any of these media which are necessary or useful for the formation of Christians and for pastoral activity” (IM 3). The intense multi-media coverage of the Council itself seemed to herald a new era of Catholic presence in the public forum. Televised papal Masses—whether at midnight on Christmas, on pastoral journeys or at World Youth Days—became a regular feature in the life of the Church and in her outreach to the modern world. The Vatican’s website www.vatican.va and its recently consolidated news portal www.news.va are invaluable online resources. In September 2013 the Pontifical Council for Social Communications expanded this development in yet another direction by publishing in e-book format a collection of the World Communications Day messages by Pope Benedict XVI. These annual messages are all dated January 24, the feast of St. Francis de Sales, patron saint of journalists, but were promulgated later in the year during the Easter season. Pope Benedict composed eight of them for the years 2006-2013 inclusive to offer his “reflection on some aspect of communication with a view to both promoting public discussion and providing some guidelines for the Church’s own engagement in this constitutive dimension of its mission” (from the Introduction by Abp. Claudio Maria Celli, President of the Pontifical Council for Social Communications). The e-book is free and can be downloaded from the Vatican website. Some of the messages have themes geared to other Church events, such as the Year of the Priest (2010) or World Youth Days. Brandon Vogt apparently does not sleep very much. He is an author, blogger, and speaker, as well as an engineer, husband, and father. His first book was titled The Church and New Media: Blogging Converts, Online Activists, and Bishops Who Tweet (Our Sunday Visitor, 2011), and included a Foreword by Cardinal Sean O'Malley and an Afterword by Cardinal Timothy Dolan. Brandon’s most recent project is the site, StrangeNotions.com, which is “designed to be the central place of dialogue online between Catholics and atheists. Its implicit goal is to bring non-Catholics to faith--especially followers of the so-called New Atheism. As a 'digital Areopagus', the site will include intelligent articles, compelling video, and rich discussion through its comment boxes.” It is, Brandon says, “the first English apostolate dedicated solely to reaching atheists and agnostics.” He recently answered some questions put to him by Catholic World Report. CWR: There are countless Catholic websites, many of them dedicated to apologetics and evangelization. What is unique about StrangeNotions.com? Brandon Vogt: Well, first the aim. Few other sites exclusively engage atheists. Most focus on Protestant apologetics, which is certainly needed, but the issues there are quite different than those relevant to non-believers. For example, at Strange Notions we don't really focus on Marian dogmas, purgatory, or the liturgy. We're concerned with more basic questions about God's existence, cosmology, morality, miracles, science, and the reliability of the Gospels. We must solidify these foundational issues before the second-level issues become important. Second, the tone. We're all familiar with the typical online religious discussion. If not, just visit any secular newspaper site and scroll down to the comments. They're full of snark, shallowness, and slander. But Strange Notions is not like that. We've done several things to ensure the dialogue remains serious and charitable, and in the site's first weeks it seems to have worked. Our tight comment policy and several moderators have kept the discussions fair and on point. Third, the contributors really differentiate this site from others. I've gathered the best-of-the-best Catholic intellects to contribute content including Dr. Peter Kreeft, Dr. Edward Feser, Fr. Robert Barron, Fr. Robert Spitzer, Dr. Benjamin Wiker, Dr. Christopher Kaczor, Dr. Janet Smith, Dr. Kevin Vost, Christopher West, Jimmy Akin, Jennifer Fulwiler, Marc Barnes, Leah Libresco, Stacy Trascanos, Mark Shea, Tim Staples, Carl Olson, and many more. Right now we have over thirty contributors and we're continuing to add more. The hope is that this website becomes the definitive Catholic response to atheism--the best of our rich theological and philosophical tradition. Finally, we have some exciting plans in the works to set the site apart, including interactive YouTube debates and video interviews with popular atheists and Catholics. So stay tuned! CWR: Why the specific focus on atheism? Lost in Translation (from Latin)? Pope Benedict XVI sent out his first tweet in Latin today. Lessons in Latin now follow. True, Nawar’s translation sounds more clunky in English than the Pope’s English tweet. But it certainly exhibits an appreciation of all the subtlety packed into the Latin tweet. For me, it demonstrates why knowledge of Latin is indispensable. Namely, that it can help one become attuned to subtleties and nuances of thought that would otherwise be missed. Indeed, I’m very happy with the Pope’s first Latin tweet, but I was in a bit of a sour mood because of the press coverage leading up to it. That coverage had me wishing for the impossible, that the Pope’s first Latin tweet would be a sarcastic: “ROMANES EUNT DOMUS”. If you don’t get the joke, then Google the phrase and watch Monty Python’s famous Latin lesson, in which a Roman soldier corrects the graffiti of an empire rebel. "There are zingers, and then there are Denzingers..."
"Reports of the death of the printed book may be exaggerated." How attached are Americans to old-fashioned books? Just look at the results of a Pew Research Center survey released last month. The report showed that the percentage of adults who have read an e-book rose modestly over the past year, from 16% to 23%. But it also revealed that fully 89% of regular book readers said that they had read at least one printed book during the preceding 12 months. Only 30% reported reading even a single e-book in the past year. What's more, the Association of American Publishers reported that the annual growth rate for e-book sales fell abruptly during 2012, to about 34%. That's still a healthy clip, but it is a sharp decline from the triple-digit growth rates of the preceding four years. Millions of people the world over have read J.R.R. Tolkien’s books The Hobbit and The Lord of the Rings, and millions more have read C.S. Lewis’s The Chronicles of Narnia. And perhaps just as many have seen the films based on these works. But not too many realize the deep Christian underpinnings of the works of both men. Ignatius Press has launched a new website, J.R.R. Tolkien and C.S. Lewis: Masters of Christian Storytelling (www.TolkienLewisBooks.com) which delves into the profound religious background of Tolkien and Lewis. Featuring books by best-selling authors such as Peter Kreeft, Joseph Pearce, Richard Purtill and others, video links featuring presentations by many of the same authors, and a plethora of articles on Lewis, Tolkien, and the Inklings, this site offers a goldmine of information for anyone wanting a closer look at the mythic worlds of Middle Earth and Narnia. Books exploring the life and writings of J.R.R. Tolkien. Contemporary Christian fiction in the footsteps of Tolkien and Lewis. Articles on Tolkien and Lewis. A one-hour video of a talk by Catholic novelist Michael D. O’Brien on “Catholic Fiction and Restoring Culture”. Ignatius Press author Joseph Pearce on EWTN Live discussing Tolkien, The Hobbit, and The Lord of the Rings. The previous version of this email contained broken links - these have been fixed. To donate to CWR, please click here. Thank you, and our apologies for the inconvenience! In the last year, CWR has brought you twice the value of a yearly print subscription—for FREE! I further noted that the usual print edition of CWR, which was published from 1991 to 2011, contained nine or ten feature articles, interviews, and book reviews, along with editorials, short news pieces, and a column or two. We intended, going forward with an online-only CWR, to post two or three features a week, along with regular blog posts and news briefs. And all for free, available online all day, every day. I’m happy to say, eleven months later, that those expectations have been met and exceeded. Since January 2012, almost 200 feature articles, interviews, reviews, and essays have been posted on the CWR site. And that number does not include the hundreds of posts on the CWR blog, many of them feature-length, written by the CWR staff and several of CWR’s regular contributors. In other words, in terms of content, CWR has been posting two full print editions worth of content every month! While some readers miss the print edition, the response these past few months to CWR online has been overwhelmingly positive and encouraging. And traffic to the CWR site has increased every month, which indicates that CWR does indeed have much to offer readers in the months and years to come. However, CWR needs your help in order to continue providing high-quality news features, interviews, and much more. Yes, eliminating the print edition of CWR reduced some costs. Frankly, it saved CWR. But offering the magazine online for free—without subscription revenue—also has costs. In order to compensate contributors, to improve and expand the CWR website, and to pursue new initiatives to make CWR even more effective, I am asking you to consider donating to CWR. I know how tough times are. And I know that not everyone can support CWR financially. 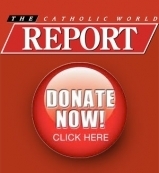 That said, I strongly believe CWR is worthy of support; I think it provides a valuable service, presenting Catholic news, analysis, and commentary from a serious and orthodox Catholic perspective. A yearly subscription to the print edition of CWR was $40.00. Perhaps you could donate that amount to CWR today. Or $20, $10, or $5. Or $100, $200, or $500. Whatever you can do will help! CLICK HERE to donate to CWR. Please know that all of us at CWR value your support—financial, moral, or spiritual support. And please know that CWR will continue to pursue excellence in writing and reporting, reviewing and editorializing, all for the sake of the truth, the Gospel, and the Church of Christ. UPDATE (Nov. 12, 2012): The original post had an incorrect link for the Live Stream; that has been corrected. EVENT: Author Dale Ahlquist, President of the American Chesterton Society, will host a live Web event to discuss and field questions about his new book, The Complete Thinker: The Marvelous Mind of G.K. Chesterton. WHEN: 8 p.m. ET on Wednesday, Nov. 14, 2012. WHERE: Online at www.LiveStream.com/IgnatiusPress. RSVPs encouraged. FORMAT: Ahlquist will open with general comments about the book and his reasons for writing it, then will take questions from participants through the website, Facebook and Twitter. What sets Chesterton apart from other writers of his generation? How is it that he was able to write about so many different things? What are the valid criticisms of Chesterton’s body of work? Ahlquist leads readers on a tour of Chesterton’s works – and thoughts. He masterfully combines Chesterton’s works with his own analysis to show how and why Chesterton was, indeed, THE COMPLETE THINKER. ABOUT THE AUTHOR: Dale Ahlquist is the president and co-founder of the American Chesterton Society, and co-founder of the Chesterton Academy – a high school in Minneapolis, Minn. He also serves as chairman of the annual G. K. Chesterton Conference at the University of St. Thomas (St. Paul, Minn.). He is perhaps best known for creating and hosting the EWTN television series: “G. K. Chesterton: The Apostle of Common Sense.” The first episodes aired in 2000-2001. Ahlquist is one of the most respected Chesterton scholars in the world. His other books on the beloved 20th-century Catholic literary giant include Common Sense 101: Lesson from G.K. Chesterton (Ignatius Press); G.K. Chesterton: The Apostle of Common Sense- a bestseller (Ignatius Press); Lepanto (Ignatius Press); and In Defense of Sanctity: The Best Essays of G.K. Chesterton. For more information, to request a review copy of The Complete Thinker or schedule an interview with Dale Ahlquist, please contact Kelly Kracht (651-470-3854 or KKracht@MaximusMG.com) or Kevin Wandra (678-990-9032 or KWandra@MaximusMG.com) of The Maximus Group. 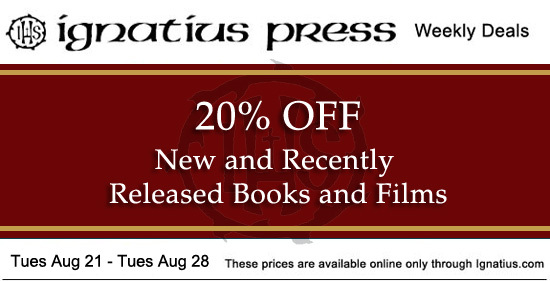 20% off New and Recently Released Books and Films! Great new releases are now available from Ignatius Press including Mark: Meditations on the Gospel of Mark, The Autobiography of a Hunted Priest and The Confessions: Saint Augustine of Hippo. Ignatius Press has historical, inspirational and educational stories for all ages. And don't forget to check out our new DVDs! They showcase equally inspirational and educational themes as our books do such as Cosmic Origins, The Culture of Life and Padre Pro, only in a different format. Get any or all of the titles offered below at 20% off! Our preachers must lead people to align themselves with the Church, filling the chasm of the past two or more generations of those not in touch with this treasury of truth. The goal is eternal salvation, the growth of the Church is in the balance. Clearly, the Holy Father is talking about the responsible use of social media (the Internet, Facebook, YouTube, and Twitter), by those called to proclaim the Word. This amounts to acquiring better focus in our pastoral response. His insights set the stage for updating seminary homiletics courses to include chapters on how to enhance preaching through the use of digital media. There is no avoiding it. Now is the time for us to consider how to eliminate the word “boring” from the feedback of the people regarding preaching in most Catholic parishes. You know the statistics concerning Mass attendance. Preaching using the new media may improve those statistics by keeping more in tune with people on the digital continent. 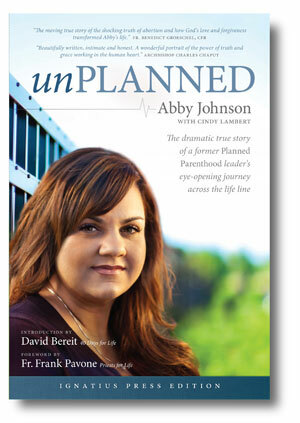 Media Alert: "UnPlanned" Author Abby Johnson "Exposes the Lie"
EVENT: UnPlanned Author Abby Johnson, former director of a Planned Parenthood® abortion clinic, will host a one-time-only webcast featuring other former abortion-industry workers who will blow the whistle on the organization and the industry – and discuss a plan for real change. WHEN: 8 p.m. ET (7 p.m. CT, 5 p.m. PT) tonight – Monday, June 11, 2012. WHERE: Online at http://exposingthelie.com/ – RSVPs encouraged. • And how YOU can help make this a reality! ABOUT THE BOOK: In UnPlanned, Johnson tells the dramatic story of the journey that unfolded as a result of a fateful day in September 2009 when a co-worker asked her for help with a patient in the Planned Parenthood® clinic she ran – how she literally “crossed the fence” from Planned Parenthood® leader to an advocate fighting for women in crisis – and the lives of their unborn babies. Ignatius Press published the Catholic edition of UnPlanned. ABOUT THE AUTHOR: Abby Johnson is a convert to Catholicism who left her job as director of a Planned Parenthood® clinic in Texas to join the Pro Life movement – after assisting in an abortion procedure. For more information, to request a review copy of UnPlanned or schedule an interview with Abby Johnson, please contact Kevin Wandra of The Maximus Group at (678) 990-9032 or KWandra@MaximusMG.com. Document leaks fuel speculation about schism within the SSPX on the eve of major CDF meeting. A letter by the General Superior of the Society of St. Pius X clarifying his response to Rome’s Doctrinal Preamble was submitted to the Vatican on April 17 and now awaits review on May 16 by the “Wednesday meeting” of the Congregation for the Doctrine of the Faith. The cardinals and bishops of the CDF will discuss Bishop Bernard Fellay’s response, and then deliver their individual opinions and reasons to the Holy Father. After studying the dossier, Benedict XVI will decide whether or not to reinstate the Society of St. Pius X canonically as an approved apostolic society of priests in the Catholic Church. Meanwhile, two private letters written in early April—one by the three other bishops of the SSPX and a response to it by Bishop Fellay and his two assistants—were anonymously posted on the Internet. This was the first major leak from within the Society since they began their theological discussions with the CDF in 2009. The contents of the letters should surprise no one who has heard or read public statements by the same writers: Bishops Tissier de Mallerais, Galarreta and Williamson sternly warn that negotiations with Rome are a trap that will lead to assimilation and compromise with the principles of Tradition; Bishop Fellay urges his brother bishops to take a supernatural view of the Church and to consider the vast improvement in the Society’s situation vis-à-vis Rome in recent years. The manner in which these two documents were leaked is itself newsworthy. Almost immediately after the confidential letters were posted online, a friend notified the editor of the Traditional-Catholic blog Rorate Coeli, who downloaded a copy of each. He reported the leak on May 9, while refusing on principle to divulge the contents. On May 10 he described the formats of the respective documents: a PDF file created on April 19 of the actual letter signed and sent by Bishop Fellay on April 14, and a PDF file created on April 5 of an unsigned draft version of the earlier letter from the three bishops (eventually dated April 7), together with a .DOC file containing an English translation thereof.